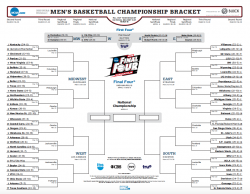 As I write this post on Friday, March 20, the NCAA Men’s Basketball Tournament is in full swing. Like most everyone else who filled out a bracket, mine was already thoroughly busted yesterday, when two 3-seeds (Iowa State and Baylor) were beaten by 14-seeds (University of Alabama Birmingham and Georgia State). Some small consolation comes from the knowledge that out of 11.57 million bracket entries on ESPN, only 273 (that’s 0.0024%!) were still correct after the first day of tournament play! Why am I bringing up NCAA basketball in a blog post about NCSE’s 2015 Friend of Darwin recipient, Neil Shubin? Well, I admit that it is partly because nobody else at NCSE follows college hoops and I just had to share with somebody. But mostly it’s because tens of millions of people watch March Madness, and they watch because the tournament always supplies plenty of passion, surprises, skillful feats, dedication, and above all, suspense; and if I could get the attention of those millions for just a few minutes, I would point them in Neil Shubin’s direction because his scientific story has every bit as much drama as a Cinderella-run deep into the tournament. Early on in his career, Shubin became fixated on finding fossils that would illuminate the emergence of tetrapods (four-legged vertebrates) from fish ancestors more than 300 million years ago. To that end, Shubin and his collaborators devoted many years of painstaking, expensive, and often uncomfortable work in the Canadian Arctic, one of the most inhospitable environments on Earth. The goal: to find fossil evidence of the vertebrate transition from aquatic environments to terrestrial ones. The quest was far from guaranteed to succeed, but succeed they did. Fossilized remains of the organism they named Tiktaalik were found in a 375-million-year old rock formation. These rocks were in just the place, of just the type, and of just the age that they’d predicted would yield this discovery. The creature shares features with its fish ancestors, but also displayed features that we’d recognize as being amphibian in nature, traits that have continued to be passed down, modified, and adapted over hundreds of millions of years, to reptiles, amphibians, and mammals—including humans. The discovery of Tiktaalik was a slam-dunk (pun intended) example of the scientific process at its best. Shubin and his colleagues drew on expertise from numerous branches of science—paleontology, geology, evolutionary biology, anatomy, genetics, ecology, and more—to give themselves the best shot at finding the precise transitional life forms they sought. The Howard Hughes Medical Institute (HHMI) included the discovery of Tiktaalik in its series of short films called Great Transitions. If you take the time to watch this film (and I highly recommend it), please note the vastness of the area the paleontologists had to search, even after narrowing down the location of their quest to the one tiny sliver of the planet with the right kind and age of exposed rock. Finding these fossils was no accident; but it was incredibly lucky too. You’ll see: making this discovery was easily as exciting as making a buzzer-beating 3-pointer to win a basketball championship. Tiktaalik made the cov er of Science magazine, and drew immediate and intense public attention. At this point, Shubin could have dashed back to his lab, his grant-writing, and his students, and hunkered down to do more research. Instead, he has devoted countless hours to telling this incredible story. He wrote a best-selling book —Your Inner Fish (2008)—for a general audience. He hosted a series based on the book for PBS and has given countless talks to audiences of all kinds. 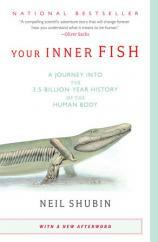 And in every book, essay, interview, film, and talk about Tiktaalik that he’s undertaken, Shubin patiently and illustratively weaves information into the story of Tiktaalik’s discovery about how science works, why science and evolution matter so much to him and should matter to all of us, and why transitional fossils are so important not only for understanding the past, but also for understanding the organisms that surround us today. He frequently points out that while Your Inner Fish explores the kinship of humans and fish, evolution explains all that we share with yeast, fruit flies, mice, and every other living creature on Earth. Lots of scientists do amazing science. Not many devote so much energy to making that science relevant to the outside world. And even fewer take on an area of science that is as deeply misunderstood by, and even frightening to, a very great number of Americans as is evolution. 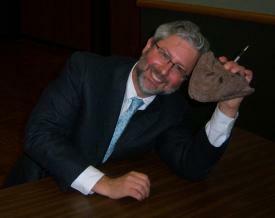 We at NCSE are deeply grateful for the investment Neil Shubin has made in communicating his work and are proud to present him with the 2015 Friend of Darwin award.